Zoom in on mind-bending new possibilities. Meet the first NIKKOR fisheye lens with zoom capability—and the first NIKKOR zoom to capture epic 180° circular images. The AF-S FISHEYE NIKKOR 8-15mm f/3.5-4.5E ED lens brings a new level of versatility and sharpness to extreme wide-angle lenses, freeing you to choose the right fisheye perspective for the shot; to create frame-filling images from as close as 15.24 cm from your subject or to follow your passion into challenging, heavily backlit, even wet and dirty situations. For those seeking a new source of inspiration and expression, this lens delivers. One lens. Two great effects. If you’re the kind of photographer or videographer who likes to think outside the box, the AF-S FISHEYE NIKKOR 8-15mm f/3.5-4.5E ED lens opens a new world of possibilities. Not only can you shoot traditional full-frame fisheye images, you can also zoom out to create fascinating 180° circular images. And you can get extremely close to your subject—as close as 15.24 cm with a 0.34x reproduction ratio—for close-up fisheye shots. Create images unlike any you've seen. The AF-S FISHEYE NIKKOR 8-15mm f/3.5-4.5E ED lens builds on NIKKOR's legacy of superb wide-angle optics and produces flawless detail across the entire frame at any aperture. Three ED glass elements and two Aspherical (AS) lens elements combat chromatic aberration and color fringing for stunning sharpness and contrast. Nano Crystal Coat (N) cuts through ghosting and flare, key because your 180° shots often will include bright light sources like the sun. Expect consistent, brilliant photos and videos. 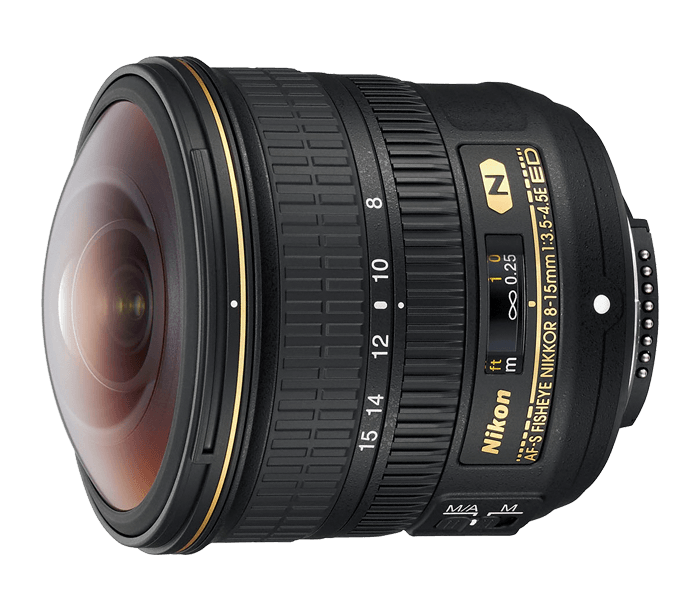 The AF-S FISHEYE NIKKOR 8-15mm f/3.5-4.5E ED lens is a workhorse. The front and rear elements have Nikon’s protective Fluorine coat, which lets grime and liquid roll right off the lens. The lens barrel is dust and moisture resistant for shooting in challenging conditions. You can even remove the lens hood and lens cap together to shoot 180° circular images, or leave the hood on to shoot a frame-filling traditional fisheye image. Simple, robust and intuitive design means you get the shot without the worry.